Relax and enjoy the simple pleasures in our charming two bedroom cottage on Hutchins Lake on a secluded wooded lot with beautiful views of the lake and Crane Orchards. Unwind on 120 feet of lake frontage with sunbathing, swimming, boating, fishing, and water sports. Experience the peace and tranquility of Hutchins Lake with an early morning ride on our kayaks and canoe, or bring your own boat and moor it to our pier. Brower Cottage is located in Fennville Michigan, about 10 minutes from Saugatuck, Douglas, and Lake Michigan beaches. We are about a two hour drive from the Chicago loop. Take a short drive to Oval Beach in Saugatuck to watch the sunsets on Lake Michigan or visit the tasting rooms at Fenn Valley vineyards and wine cellar. Shop for antiques and art at the shops and galleries in the Saugatuck / Douglas area. Walking distance from Crane Orchards and Pie Pantry for delicious fresh baked pies, sweet cherry picking in the spring, peach picking in the summer, and apple picking in the fall. Minutes from the Saugatuck Dunes State Park and Allegan State Game area for hiking, hunting, and cross country skiing. Salt, pepper, sugar, cooking oil. 2 person kayak, 1 person kayak, 3 person canoe. Life jackets, paddles, and water toys. Fire Pit, Mobile Device Ready Stereo, Bean Bag Toss Game, Bocce, Glassware, Pots and Pans, Kitchen Towels, Hammock, 30 stairs to lake. Nice quiet retreat for a weekend. Everything was as advertized and ready as promised.We appreciated the before and after phone calls by the owner. He also sent us on some suggested places to dine.Nice place and would recommend this location. Would like to return in the summer months? We have stayed several times and each time has been enjoyable and we always look forward to returning. Jamie and Joe make sure that your stay is great! My sixth visit;my sixth perfect stay! I simply love this cottage. As always, I hated to leave on the final day and cannot wait for my next visit. The house is very nicely furnished, immaculate, and so very peaceful (though I hasten to say there is much to do for those who want to use the lake for more than an appreciation of the view!). The small towns in the area are charming; the restaurants very good, with a couple being exceptional. Brower Cottage is a treasure, no matter what the season. I'll be booking soon for visit 7. We are repeat visitors. This little gem continues to get it right. Always perfectly clean and tidy, solicitous thoughtful owners and just the right amenities. It is always a pleasure to vacation here. The cottage was lovely. Peaceful, quiet, tranquil setting. Very well equipped, organized and clean. 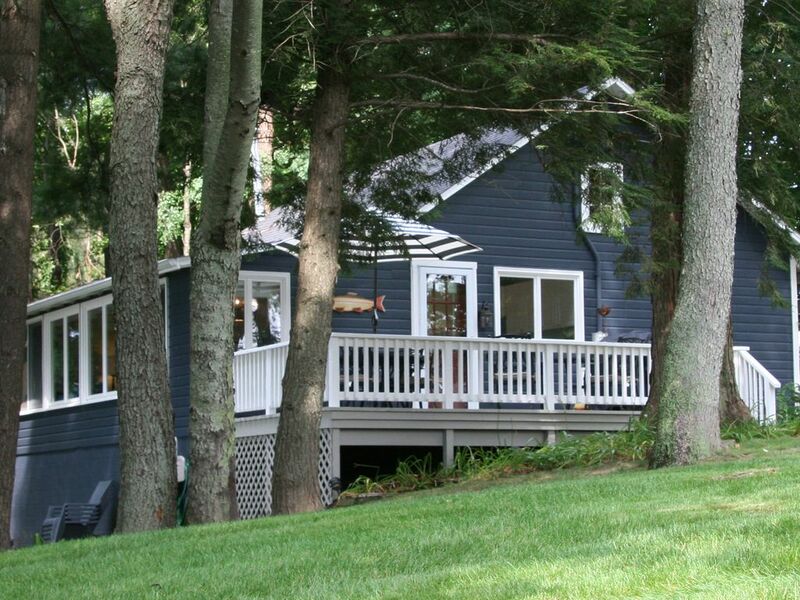 Beautiful view of the lake and only minutes away from Holland or Saugatuck area. Great communication with the owner! towns and restaurant. Also clean and nicely equipped. Other Activities: Knee boarding, turtle spotting, dune rides, charter fishing on Lake Michigan, kayaking, biking, snowmobiling, horseshoes, shopping, mini golf, boating, wildlife viewing, wine tasting, art galleries, fruit picking, wake boarding. We will consider 2 night stays at $250 / night. Please contact us via the links on our listing.